All in all, if you're looking for a quick joyride, this little egg packs a punch. Great for vacations or business trips, or really just if you are looking for a little something special at home. Great product for the price, especially if you can wash and reuse. It is definitely worth picking up all 8 textures and finding out which one is your favorite! Having used a male masturbator before, I doubted that such a little thin dome could give me any sort of sensation. Boy was I wrong. This little egg packs a punch and it is great for travel, because it can be tossed in any size suitcase, or even a briefcase if you are feeling adventurous in a plane! With lubricant already included in the package, this egg is a no-brainer! The only downside to this little egg is its size. If you are slightly above average for length and you get too carried away, expect at the very lease a small hole in the top - or worse, you might even break through. The flexible and soft-but-not-slimy feel of the egg gives a great skin-like stimulation. This specific texture inside the egg is a little more powerful than the rest, but definitely does not overpower. The design is VERY smart. Small, portable, and discreet. Because of the egg's flexibility, no matter what size you are, you can easily enter this toy. Larger gents out there, be aware of how crazy you go to town, because the tip might pop through the thin layer of material in use. Designed as a one-use product, you are more than welcome to use, enjoy, and dispose. However, I've found that if you take care of the egg during use, you can gently rinse the egg with hot water and soap, let it air dry inside out, and reuse for up to 4 or even 5 times. I have only tried this using the Tenga lubricants, so I'm not sure how that would work using other brands. If you are careful enough with the egg, and you wash it properly after use, I've found that I can reuse the egg up to 4 or even 5 times. This is a really nice option if you want to use it for a week-long getaway, or if you just want to get as much use out of it as you can! Reviewed by tjs021 (Eden Advanced reviewer) Offering my personal opinions on what's best! Have you actually torn a hole in one during use, or popped through the tip? Their material is very very stretchy and made to stretch thin like that. 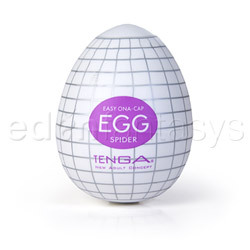 Are tenga eggs any good? Would this work for an FTM? Anyone have this product? Does it work well? Anyone use this with another person? Anything like the Tenga Egg Masturbator? Thank you for viewing Egg masturbator – masturbator in a plastic case review page!